(75%) 6 of 8 customer would recommend this product to a friend. Safety transformer supplies 12 volts to pool and spa lights, submersible fixtures and outdoor garden lights. Designed for safe operation with a grounded shield between the primary and secondary windings. Also includes built-in circuit protection that disconnects power to the transformer in case of defect or overload. Can be used with multiple 12v lights, not to exceed total wattage of 300. I have a California series Two 300 watt timer transformer over 15 yrs which recently bit the dust. An electrician connected a photo cell to it bypassing the timer which worked just fine for a few yrs, it is now not working at all. Will this transformer work for me? Hi Ray, the Intermatic 300 Watt Transformer - PX300 will work. A Answered on 6/20/2018 by InyoPools Product Specialist Andy O.
Hello Dominic- You would need to know the wattage of the light and/or lights that are connecting to the transformer. For example, if you have three100 watt lights connected to the transformer you will need a minimum of a 300-watt transformer. Okay, since the 400 watt light bulb will not work with the PX300, do I just replace the bulb with a 300 watt or do I have to purchase a new fixture? Hi Kristan, Can you confirm that your light is 12 Volt and not 120 Volt? Typically 12V pool lights are only made in wattages up to 300 Watts. If you do indeed have a 120V 400 Watt light then a transformer is not needed for a 120V light. I have a 400 watt Pool light. Will this unit work? Hi, Kristan. This transformer will not work, you will need the PX600 model to operate a 400 watt 12v light fixture. A Answered on 8/13/2017 by InyoPools Product Specialist Alex V.
Steve, Up to 3 Universal ColorLogic/CrystaLogic LED pool lights can be connected to a single PX300 transformer. The PX300 has two black output wires. I am a bit confused. Does it matter which one you hook up to the black on the light? Is there a common and a hot on a 12v?I haven't order 12v LED lights yet and am assuming they have white,green, and black leads??? I recommend giving Intermatic a call for those details, their number is 815-675-2321. A Answered on 4/13/2017 by InyoPools Product Specialist Andy O. Is it possible to send me a picture of the inside of this box or post one for us to view. Thanks, as I want to see how many Breaker switches this box will hold. A Answered on 1/30/2017 by InyoPools Product Specialist Stacey M.
Hello Gib, unfortunately all we have is a picture of what is inside the box for wiring. I have an old pool light. I am changing to an Intellibrite 5G color 12v light with a controller. The current 300 watt transformer is connected to the 13v tap. The 13v cord is approximately 100' long. Is this 13v connection satisfactory?. A Answered on 1/24/2017 by InyoPools Product Specialist Adam Y. There are setup for 12v,13v, and 14v I would make sure your on 12 volts. A Answered on 12/21/2016 by InyoPools Product Specialist Adam Y. Good morning Michael, Yes with them being Led they're caping at 35 watts so the 300 watt transformer will be plenty enough. A Answered on 12/5/2016 by InyoPools Product Specialist Lennox H.
Hi. Yes, this PX300 transformer can be used to power the Hayward SP058150 light. My LED pool light flashes only briefly when the switch is thrown; it won't flash at all after that when switched on (unless I wait awhile). Is the problem likely the transformer? I have an INtermatic PX100. thanks! A Answered on 8/8/2016 by InyoPools Product Specialist Lennox H.
Hi Chris, Yes, the problem could be the transformer not sending the correct voltage to the light. A Answered on 6/29/2016 by InyoPools Product Specialist Joe S.
You would need two transformers as each light is 200 watts. A Answered on 7/3/2016 by InyoPools Product Specialist Lennox H.
Hi Gary, The PX300 is not compatible because it's maxed amperage is 3..
A Answered on 6/26/2016 by InyoPools Product Specialist Lennox H.
Hi Sal, The 300 Watt Transformer will work if you have a 100 watt light as long as the total wattage does not exceed 300 watts. would this work with a Hayward AquaRite (Goldline) electronic chlorine generator ? if so, which size wattage is suitable for an 18 x 36 in ground pool? 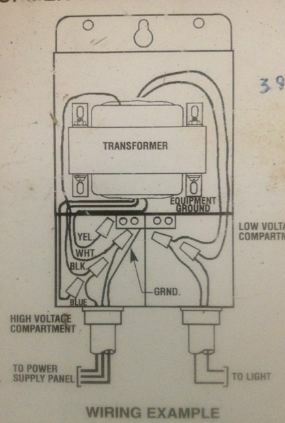 Hi Roland, this transformer will not work the Hayward Goldline Aquarite. You would need this Hayward Aquarite Transformer. Is this unit acceptable for replacing the SafetyVolt ST300 pool lght transformer? Hi SLR, This Intermatic 300 Watt Transformer will replace your SafetyVolt ST300 transformer. 2 of my pool lights went out weeks apart. The pool service states that I must have a 300 watt light replacement vs a 100 watt light replacement because I have a 300 Watt Transformer. Is this true? Hi, Yes, a 300 watt transformer is typically used with a 300 watt 12 volt pool light. A Answered on 6/19/2016 by InyoPools Product Specialist Alex V.
Hugh, The PX300 would be installed just like any 12v transformer. The unit comes with instructions. Is this transformer hardwired to 120V or plugs into outlet? Does it have a switch to turn on and off pool lights? A Answered on 5/11/2016 by InyoPools Product Specialist Lennox H.
Hi Costas, The transformer is hard wired to the breaker box that controls the pool lights. My new international 300 watt transformer buzzes continually when turned on. Installed by a pool company. They don't know how to fix it. How can I fix it? Thank you. Hi James, I'm not sure what's causing the buzzing sound, I would recommend contacting Intermatic at 815-675-7000 to troubleshoot. The operation and service manual states that the input must be 120v 3 amp max. How do I insure that I do not exceed 3 amps input? A Answered on 6/18/2015 by InyoPools Product Specialist Patrick P.
Hi Mike, If you are using this for a pool or spa light then as long as you stay at or below 300 Watt lighting then the amperage would be below 3 amps. This can be the combination wattage of multiple lights, for example three 100 watt lights would be fine. A standard 300 watt pool light draws 2.5 Amps at 120V. is the voltage on the 12v side ac or dc? A Answered on 6/9/2015 by InyoPools Product Specialist Dennis R.
Tom - The voltage on the 12V side is still AC. A Answered on 6/11/2015 by InyoPools Product Specialist Lennox H.
Sam, The Intermatic 300 Watt Transformer can go bad, however you may want to an electrician take at look at your lighting system because the light being dimmed may not be due to the transformer. I have a PX300 trying to run a pool light by Haywood, 12V 300 watt. The pool light would come on sometimes, then shut down. I had a spare PX300 new. Installed it. Have 12.18 volts to the light. Nothing lights. I tried 2 new bulbs. Nothing. Went straight to the transformer, hooked up a drop light with wire nuts to 12 volt leg and ground. Nothing. Ideas? Am I missing something? A Answered on 5/25/2015 by InyoPools Product Specialist Alex V.
Terry, Sorry to hear of your issue. I would recommend calling Intermatic to trouble shoot. You can reach them at 815-675-2321. Does it matter which lead is connected to the pool light wire after the transformer, they are identical, both are black. A Answered on 5/14/2015 by InyoPools Product Specialist Patrick P.
Hi Allan, It doesn't matter, just make sure they are the 2 thicker black wires that are going to the 12 volt light. Can this transformer be connected to a 230v source? A Answered on 4/8/2015 by InyoPools Product Specialist Robert M.
Hello Julio - Unfortunately this transformer cannot be hooked up to 230v. If a use a 300 watt transformer but only have 75 watts of LED lights does the transformer consume the 300 watts or the 75 watts being used by the LED lights? A Answered on 4/6/2015 by InyoPools Product Specialist Brian M.
It would only consume the wattage needed. No more. A Answered on 10/16/2013 by InyoPools Product Specialist Patrick P.
This transformer is twelve(12) pounds(lbs). Can you hook up more than one light to this transformer? The PX300 is a 300 watt transformer. You can connect multiple lights to the transformer as long as the total combined wattage does not exceed 300 watts. I am going to purchase two 12 Volt lights do I need to purchase a transformer with these lights? A Answered on 12/16/2006 by InyoPools Product Specialist Patrick P.
The power coming from your house is 120V so you will need to purchase a transformer to drop the voltage from 120V coming from your house down to 12V going to the pool light. We sell two transformers the PX100 which can handle up to 100 watts and the PX300 which can handle up to 300 Watts. You may also put multiple lights on one transformer, for example if you had two 50 watt lights then you would only need to purchase one PX100 transformer and wire both lights into this single transformer. Is is this transformer weather proof? A Answered on 6/5/2006 by InyoPools Product Specialist Patrick P.
Yes the Intermatic transformer is weather proof. The transformer install was the one step that I hired an electrician to perform since it required conduit and we added an additional breaker to the Jbox. The installation was about the same cost as 1 new Pureline color-changing LED bulb. Very happy with the product. It arrived on time and performed well. A++ transformer doing is job, easy to install. Great value. It was priced better than a local retailer even with shipping. The transformer arrived in two days. Shipping status was great. Only issue was the wiring diagram was in french. Quick lanquage lesson solved the situation. Delivery was very prompt and packaged well. Transformer was exactly what I wanted and very easy to install. I highly reccomend it. Pros: Does what it's supposed to. Cons: Kind of noisy, mount it away from where you will be. Had it for nine months with an Intellibrite systems, works OK. It does make noises when the lights are programming (the controller programs the lights by powering off and on rapidly a set number of times for each color or program), and hums a bit otherwise. I have it mounted on a back wall behind a screening fence, still can hear it.